every number from 1 to 25.
only use each number once in a sum. We can make all the numbers from 1 to 25 using this Daisy. Can you do better than this with a different set of numbers? 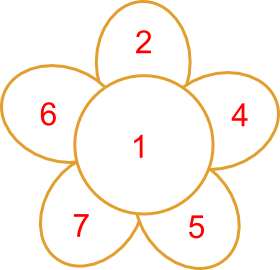 The challenge is to find six numbers to go in the Daisy from which you can make all the numbers from 1 to a number bigger than 25. This task was found in one of Brian Bolt's books and developed by MEDIAN in their collection of interesting number resources. Resourceful. Games. Working systematically. Selecting and using information. Addition & subtraction. Interactivities. Resilient. Positive-negative numbers. Visualising. Factors and multiples.